A brand notorious for their commitment to the active workspace market has finally introduced electric standing desk to their repertoire. The ProDesk 60 Electric by Varidesk is a full size, strong, durable, quick to assemble, attractive, commercial grade standing desk that fits perfectly in any home or business office. As well as looking great, if you are shopping for a solid, simple, quiet standing desk, this may be a perfect choice for you, but as it comes with a hefty price tag, let us help you in the decision process. DO NOT MISS: Are you a Varidesk fan? : Take a look at our analysis of the 21 best Varidesk products in 2019. DID YOU KNOW? : The Varidesk ProDesk 60 actually features as one of our best rated standing desks of 2019. Adjusting from 25.5 inches to 50.5 inches, the epic 25-inch range puts it in the realm of the tallest standing desks in the market. Within this space, the infinite height adjustment means that you can fix the desk to the exact millimeter of your choice, which is a great feature. Not only this but is it also extremely stable at pretty much all height settings. Looking at our height chart for ergonomic standing desk heights, we can see that this desk is sure to be a good fit for most users either standing or sitting. Once you have programmed your 3 favorite settings in the control panel, you can go from standing to sitting with the touch of a button and move seamlessly between the three saved heights. This is ideal for people who like to sit and stand frequently, or for those who share a desk with others. The control panel display screen also makes transitioning super simple as you adjust to your perfect position quietly and easily. 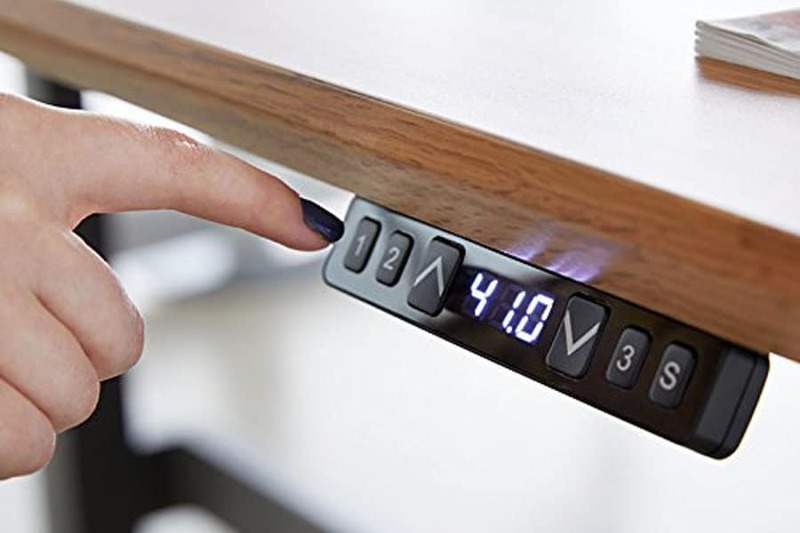 Like many electric standing desks, the Varidesk has a control panel to preset height levels. With a bold claim to assemble in under 5 minutes, Varidesk seems pretty confident that this is one of the easiest desks on the market to put in place. The only other thing to note is that the desk is very heavy, so make sure you have a mate available who can lend a hand to get it in position. 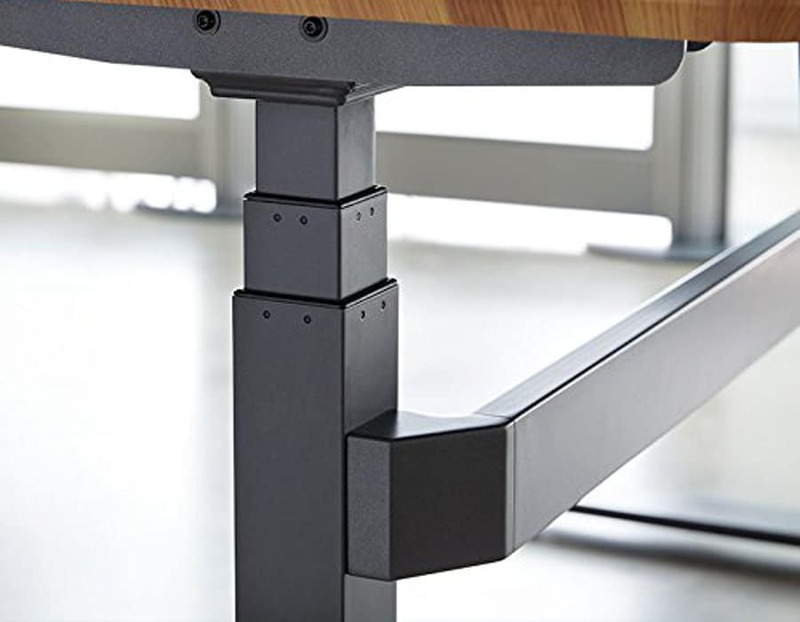 The ProDesk 60 solid steel frame and enhanced steel crossbar, means that it is exceptionally stable and can support up to 250lbs on its tabletop. With a shipping weight over 170 lbs., it is easy to see where the strength in this desk comes from. In wobble tests, it showed that the desk is at its strongest below 45”, where you will be able to work without any rocking impacting your concentration. The ProDesk 60 has been made with commercial grade materials to ensure stability and durability. You can choose from a selection of finishes with 5 options for the desktop: White, black, butcher block, reclaimed wood, darkwood. Varidesk has also included an easy yet great design feature which allows cables to drop between the desk and the wall with a simple cutout. Unfortunately, this cable management box is incompatible with many monitor arms, so make sure you investigate further if you already have a set up that you prefer. Varidesk has a 30-day guarantee on all products with free shipping. Delivery with FedEx is quick, usually, around 7 days, which is refreshing as some standing desks can take weeks to arrive. Another bonus is that they will also send out replacement boxes at no charge and even cover the return shipping if you don’t like your desk. That is tough to beat and should give you peace of mind should you want to give it a try first. Just remember that the legs and desktop ship separately in 2 boxes, and they are seriously heavy, so have someone on standby to assist. 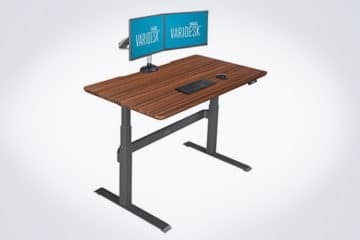 Varidesk recently changed their warranty from one year on everything to various warranties for their wide selection of products. The ProDesk 60 Electric falls under their new five-year warranty coverage. This includes all surfaces, hardware, mechanical parts and components, including motors and electric components. Prior to this point, they had one of the worst warranties in the industry, so it’s definitely a wise move for them to offer their customers a better peace of mind. At nearly $1,000 for a desk, you are going to want to be 100% sure that this has everything you need and more, before jumping in. Quality, stability and functionality wise it is great, but does it do enough to justify that price tag? There are equally competitive products in the market that come in cheaper, so it really depends on whether this ticks all your boxes practically and visually. As we have seen with other standing desks, a keyboard tray will mean that your wrist/keyboard height can be adjusted separately. The ProDesk 60 is just a solid table top so doesn’t have this feature. So in order to get the correct ergonomic posture, being such a large desk, you would really benefit from having an adjustable monitor arm in play to get the right position when both standing and sitting. The stability bar is placed in a way that be annoying when in a seated position. Many desks removed this component for this very reason some years ago and looked to a crossbar to keep it stable and steady. When sitting, you will just need be careful that you don’t bang your knees, something that you will only be able to test once the desk is in place. The build quality of the Varidesk frame is very high, although it seems some people don’t like the placement of the horizontal stability bar. The ProDesk 60 is only available as a 60” x 30” desk, which is pretty large and takes up a lot of floor space. It would be good to get a range of smaller options that would fit in less flexible areas at home or at work. At the moment the only other option is the ProDesk 48 which is 48” x 30”. The ProDesk 60 is a good looking standing desk that is a pleasure to use right from delivery day. The pre-programmed settings make it ideal for someone that moves between sitting and standing quite often. The rest of the features, namely strength and stability are fantastic and a real testament to Varidesks’ experience in this market.